I have a pile of bills to pay and a million errands to run. (Actually 11. I have 11 separate stops I need to make this afternoon). There are cases and cases of fruit that need prepping for jam and about 40 dozen eggs I need to sell. We had a really tasty dinner the other night, though, and before I get too swept up in the usual nonsense of Monday, I want to share this recipe with the internet universe. One of my egg customers is an avid hunter and fisherman, and I end up doing a lot of bartering for beautiful fresh meats and seafood. This last week I ended up with a big piece of fresh cod. Sure, I could have grilled it with lemon, or made a fish fry, but you gotta go big or go home, right? 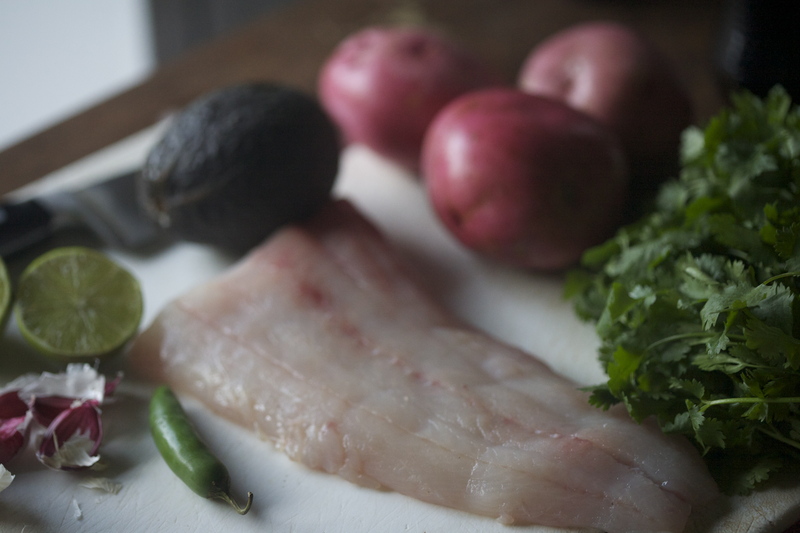 Hence, a spicy fish and new-potato stew with rich spices, brightness from lime juice, chilis, cilantro and avocado, and tangy green rice cooked in tomatillo sauce and chicken broth. 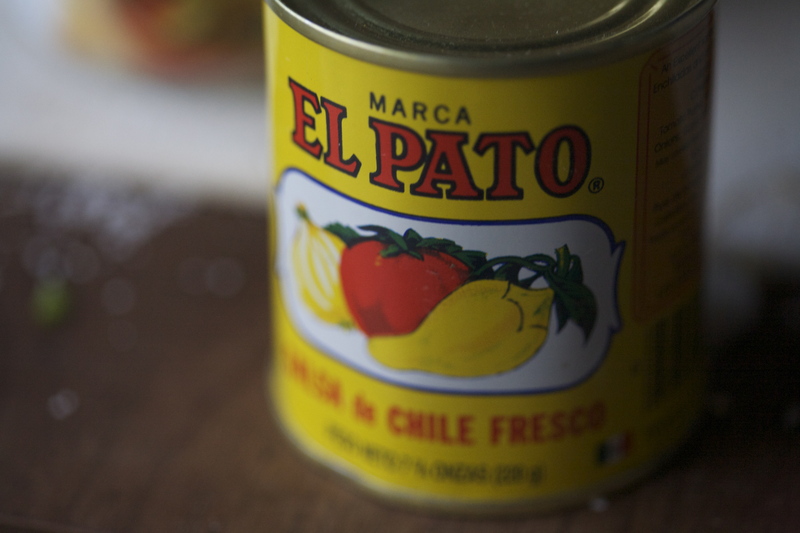 One of the ingredients I’ve used is this canned spicy tomato sauce. The only reason I buy it is the pretty picture on the label, since I could easily make it myself. If you don’t want to buy it, just put in a can of plain old tomato purée or some diced tomatoes fresh from the garden. The brand I used has some kick to it, so you can add a pinch of cayenne if you want to replicate the flavor. Can I just say, totally off-topic here: It is REALLY amazing how expensive the cell phone bill can get if you just go a teeny little bit over your minutes. I actually kind of feel like someone punched me in the face right now. 1 piece of fresh cod, about 3/4 lb. 1. Season the raw cod with the coriander, cumin, garlic powder and oregano. 2 Heat olive oil in a large cast iron skillet. Add shallots, garlic and serrano chili and saute for 3-4 minutes on medium-high heat or until the shallots are translucent. Add the fish to the skillet and saute for 3 minutes on each side. 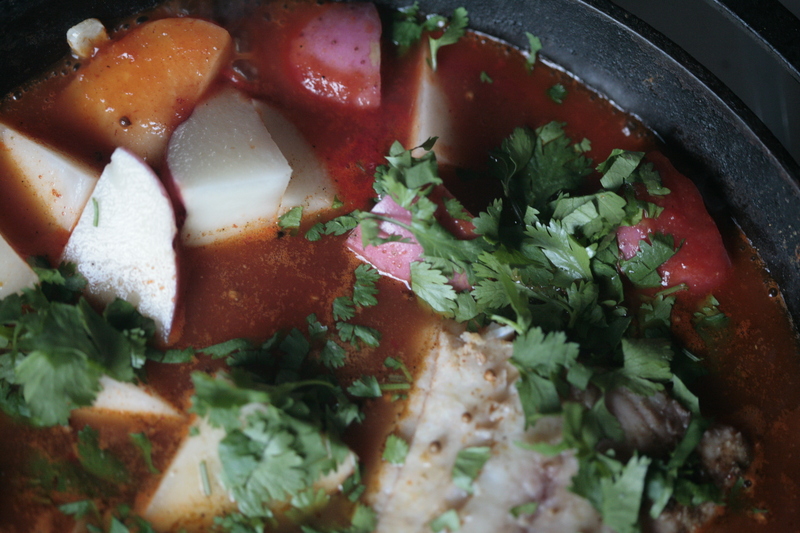 Add potatoes, vegetable broth, spicy tomato sauce, and half of the chopped cilantro. Cook on low heat, stirring occasionally, for about an hour. (Maybe more, maybe less: the cooking time for a stew depends on how hungry and how patient you are). 3. When the potatoes are cooked through and the broth has turned from a bright red liquid to a more caramelized reddish-brown thick sauce, the stew is ready to eat. 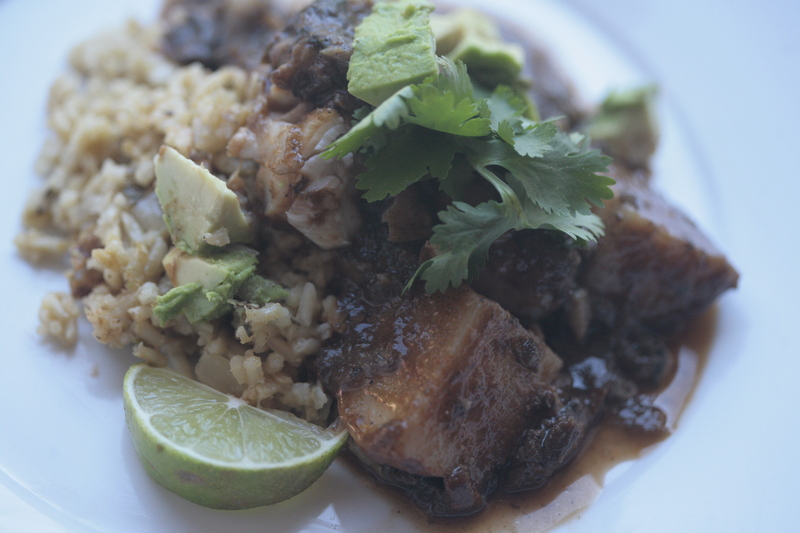 Serve it over green rice with diced avocado, cilantro and lime juice. (The lime juice is vital. Make sure to give each serving a liberal squeeze of juice right before digging in; the brightness of the lime and cilantro will balance out the richness of the spices). Heat up the olive oil in a medium sauce pan. Saute the garlic and chili pepper for 2 minutes. Add in the salsa verde and bring to a simmer. Add in the chicken broth and rice and bring everything to a boil. Stir, then reduce the heat to low and cover the pot with a tight-fitting lid. Cook for 20 minutes. Remove from heat. Add chopped cilantro and season with sea salt. Fluff the cooked rice with a fork and serve with the fish stew.